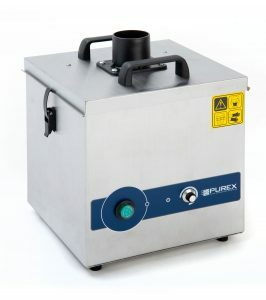 Fume extraction offers several unique benefits for exhausting wave and reflow applications. 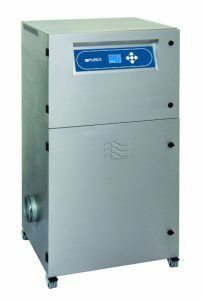 One of the most important is improved process consistency due to our technology to monitor and maintain air flow. Additionally, we provide portability, ease of maintenance and improved energy costs. Using Purex fume extraction allows you to utilize the heat in the winter rather than sending costly air back outside of the building; which will reduce the need for costly air make-up systems on your roof top. We have a solution for your Reflow, Wave and even de-dross and solder pot coverage. We know conformal coating cells are often moved frequently and fumes are a nuisance to those working in the area. In some areas, permitting is also very difficult and costly for this process. 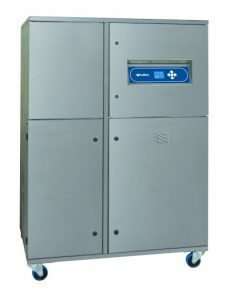 We provide machines to deal with fumes from your coating machines and also the curing cells which are attached. Let us help you with the entire process. From coating to curing to off-gassing on drying racks. Harmful and odorous vapors can easily be managed with our filtration while also offering and flexible and easily moveable exhaust alternative. Working with laser processes is our expertise! During the depaneling process particulate and vapors are released from the FR4 material. 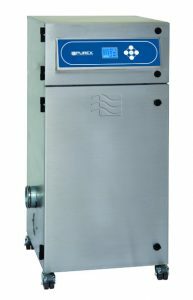 We offer systems to capture the particulate and the vapors allowing your process to be clean and safe in the workplace while also providing a flexible and portable solution. Working at close proximity to solder and flux fumes, workers need the best protection. With ongoing health concerns such as chronic asthma, acne, and other issues it is critical to provide a safe work environment. We offer a full line of solutions with machine sizes to extract from 1 station to over 20! Also offering a full line of capture options including lighted stainless-steel arms to clear hood cowls and cabinets. As processes in through-hole technology become more automated, selective and robotic soldering become more popular. Our systems are portable and flexible enough to deal with the enclosed selective solder machines as well as the open-air soldering robots. Let us help you find the right solution. 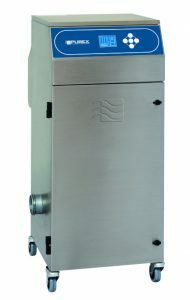 Marking of circuit boards and enclosures has become easier and more efficient with the use of laser marking equipment. Whether it be a stand-alone marking unit or a marking laser integrated with other processing equipment we have solutions to remove particulate and vapors caused by these processes. Improper extraction can cause issues with the quality of marks and increased maintenance cost, not to mention poor air quality.